FAMILY: Claude Jr. (dad), Camille (mom), Frances (sis) plus step families and too many cousins, aunts and uncles to mention…big family. Claude Clayton is a true southern gentlemen. Relatively soft spoken, quick to greet you with a smile and ready to open the door for anybody three steps away…until he takes to the race course. Then this 30-year old Sea-Doo watercraft enthusiasts from Tupolo, Mississippi USA does his best to put everybody at least three steps behind him. The fact that his race machine of choice is the Sea-Doo RXT-X watercraft helps make that task a bit easier. Clayton has experienced solid success on the race track, moving up through the novice and expert ranks and now making waves in the Pro classes. He has chosen to work with legendary tuner and IJSBA and BMX racing Hall of Fame racer, Tim Judge and that combination has set high hopes for future championships for the duo. Clayton is looking to update his ride to the new Sea-Doo RXP-X for upcoming seasons, a lean-in machine that should have both Judge and Clayton clamoring for the season to begin. OnBoard asked the Sea-Doo X-TEAM rider to talk about his SEA-DOO LIFE. CLAUDE CLAYTON – I grew up in Tupelo, Mississippi playing all kinds of sports and spent a lot of summers traveling and doing adventure sports like whitewater kayaking, mountain climbing, etc. I think my competitiveness really didn’t get serious until maybe 5 years ago. It definitely got a lot more serious with watercraft racing. CLAUDE CLAYTON – I own and operate a power sports sales and service business in Tupelo, and work for our family business that is 106 years old. Reed’s is a small chain of department stores in Mississippi. ONBOARD – Claude, How were you introduced to watersports? CLAUDE CLAYTON – My dad grew up going to the lake on the weekends, so we’ve always had a boat. Growing up, we had a lake house at Pickwick Lake on the Tennessee River and I started riding watercraft around 1989. CLAUDE CLAYTON – I’ve always ridden a Sea-Doo…how about that? I think that in my head, I have those moments in racing that I am most proud of, maybe a specific hole shot, or a specific pass, but I guess on paper, I would say that I won world and national championships as an amateur, and I consider myself to be one of the top runabout racers in the U.S. and the world. I think we’ve proven that. ONBOARD – Where is your favorite PWC race site? CLAUDE CLAYTON – I have to say Lake Havasu in Arizona. As a racer, how can you love anything more than being in that city, for the World Finals?? It is in the desert so it has great temperatures for watersports and the Colorado River provides the perfect boating oasis. As a fan of the sport, how could you ask for a better backdrop for the biggest event in the sport of PWC racing?? CLAUDE CLAYTON – I love being on the water for one. Riding a Sea-Doo, especially the newer models with modern technology, is amazing. I ride motocross too, and love it. Watercraft racing is kind of like motocross racing, but instead of dust, you have cool water, instead of girls in jeans and hoodies, you have girls in bikinis, instead of race sites in the Mississippi back woods, we get to race at places like Panama City Beach, Myrtle Beach, and Havasu, instead of cities complaining about all the noise, they are paying to bring in our events…it’s almost the perfect motorsport! ONBOARD – Claude, where is your favorite non-racing, riding location? CLAUDE CLAYTON – Even though I don’t get to go much anymore, I would have to say Pickwick Lake. That’s where I cut my teeth on a watercraft and that’ll always be my favorite spot. ONBOARD – What is your dream PWC ride/adventure? 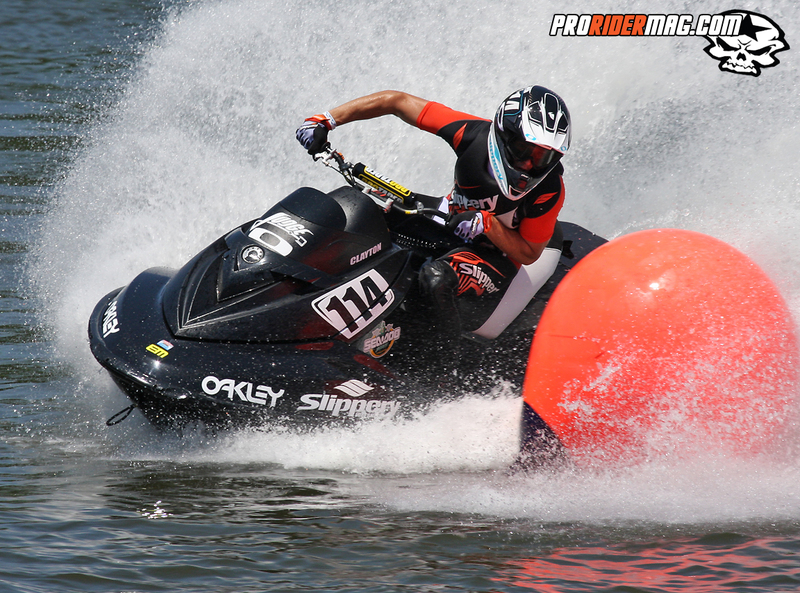 CLAUDE CLAYTON – To win Pro Runabout at World Finals on a Sea-Doo. 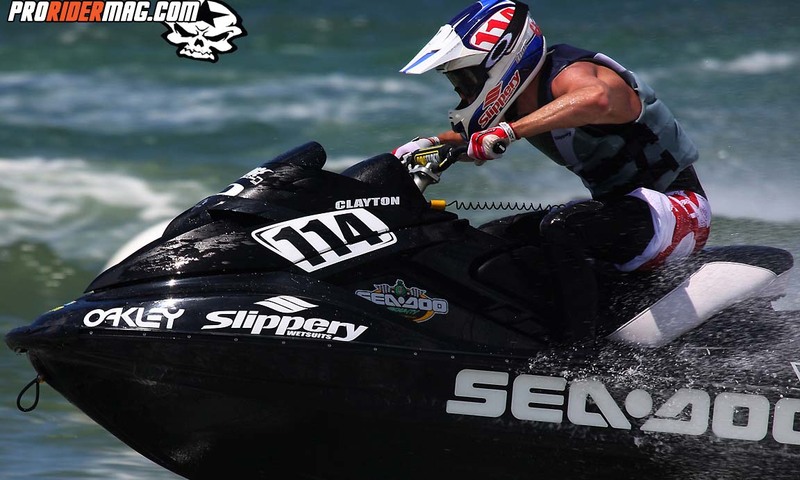 CLAUDE CLAYTON – For 2011, we raced a Sea-Doo RXT-X built by Judge Motorsports. For 2012 we hope to be on the new RXP-X 260, it’s an amazing watercraft. Whatever we end up on, it will be backed by Oakley and Slippery and with Tim Judge of Judge Motorsports it will get me to the first turn in front! 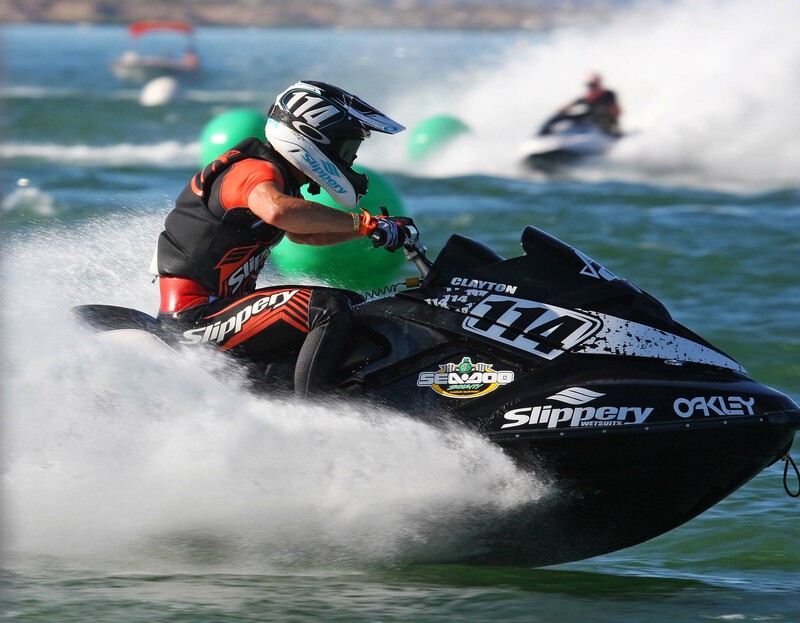 BRP thanks Claude Clayton for his time and dedication to the pursuit of PWC racing glory aboard Sea-Doo. You can follow Claude on his Facebook page.